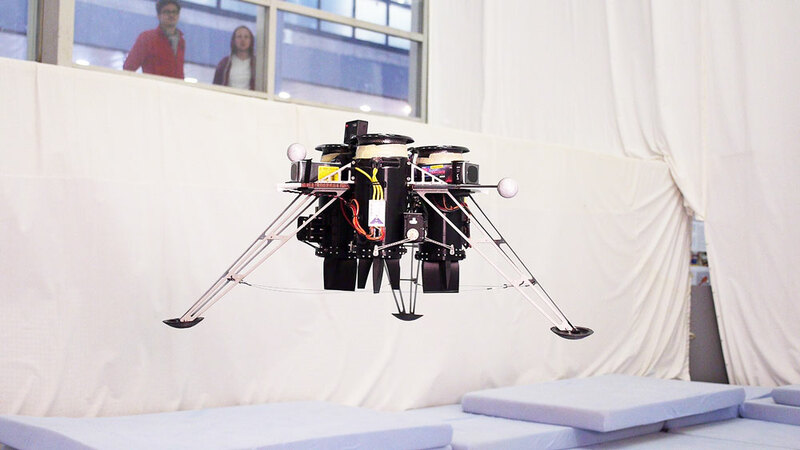 The Flying Platform is a new flying machine developed at the Institute for Dynamic Systems and Control at ETH Zurich. Its purpose is to study the use of electric ducted fans as control and propulsion systems for flying machines in applications where size is limited and high static thrusts are required, for example in aerial vehicles capable of vertical take-off and landing (VTOL), hovercrafts or even actuated wingsuit flight. The video below shows how the thrust vectoring is used to stabilize the vehicle. As a starting point we derived a physical model of the flying machine, which helped us to understand the behavior of the system. For instance, as the electric ducted fans are placed farther away from the center of the vehicle, the lever arm of the thrust vectoring system increases – but so does the inertia of the system. These are conflicting requirements for high maneuverability, where one seeks to maximize the lever arm, but still keep the inertia small. The physical model helped us to find a suitable tradeoff. In parallel, the electric ducted fan and the thrust vectoring mechanism were characterized quantitatively by doing measurements on a separate test bench. In this way, the properties of the actuation – e.g. the total thrust, the time constants of the fan, and the thrust vectoring mechanism – could all be determined experimentally. Figure 1: The test bench for characterizing the electric ducted fan and the thrust vectoring system. The measurements on the test bench were used to update the physical model of the flying machine and to assess its flight performance in simulations. 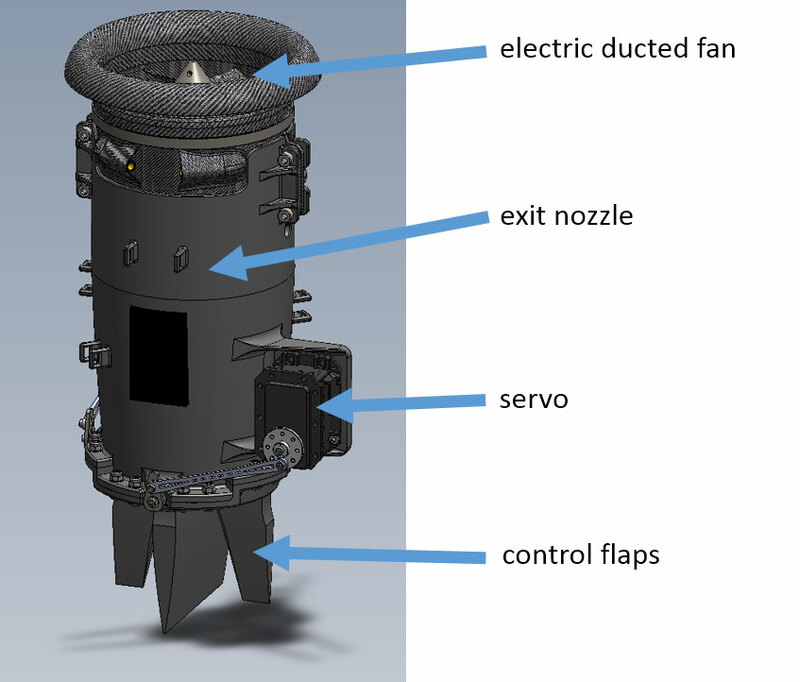 Figure 2: Electric ducted fan with exit nozzle and control flaps. The analysis based on the physical model was used to determine the specifications of the hardware design. The three electric ducted fans (Schübeler DS-51-DIA-HST) were aligned on an equilateral triangle of 30cm side length. A carbon fiber honeycomb structure was used to connect the fans, and a 3D printed exit nozzle was mounted on each fan (see Fig. 2) in order to increase the airflow velocity and augment the thrust vectoring capabilities. The exit nozzle also integrated the two servos that actuate the control flaps. The flaps were optimized for a high stall angle using the XFoil software package (see https://en.wikipedia.org/wiki/XFOIL). Three aluminum feet support the structure when the Flying Platform is on the ground. In total it weighs 7.6kg. Power is delivered by six 2-cell (or alternatively three 4-cell) battery packs that have a capacity of approximately 6.6Ah. The power consumption at hover is roughly 5.3kW at 120A. A PX4 flight computer is used to run the control algorithms. 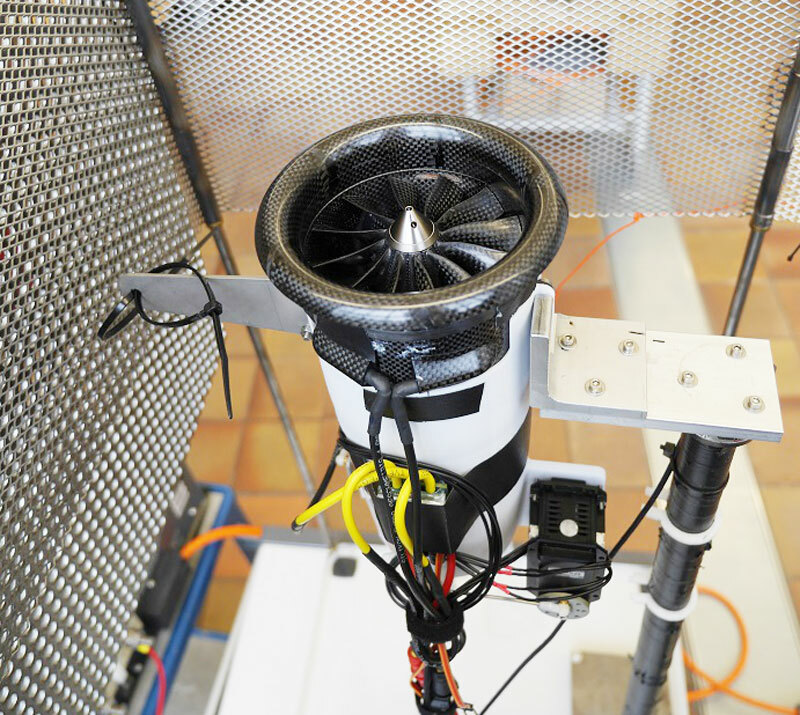 Each fan delivers a maximum thrust of 4.2kg, which results in a payload of approximately 3kg. The Flying Platform is used for benchmarking novel control strategies that account for actuation limits. In particular, the flaps are limited to a range of approximately 18°. Control algorithms explicitly accounting for this limitation can provide larger stability margins and other performance enhancements. We are currently investigating model predictive control algorithms. The idea is to explicitly exploit the physical model of the system – including input and state constraints – for making model-based predictions. Since these methods are computationally expensive, we seek to trade off the prediction accuracy with computational cost, and quantify the consequences of such approximations.